In June of this year, I made a big leap of faith. Whilst I’m very much the UK Minimalist, terribly English about things, and love some of the very British comforts, I don’t live there any more. I’ve relocated myself to the other side of the world for a while, quite likely a bit longer than that. Now I’m not about to tell you tales of travel and adventure, of living in various countries or do a ‘Colin Wright’ on you. I’m not about to be voted anywhere. There are far too many more, far more brave than I. This blog post is about what minimalism enables. What you do with all of that space, time, and possibly money, that adopting a minimalist lifestyle brings ? Imagine if you will, that you’ve achieved that ‘minimalist nirvana’ ( isn’t that such a cool way to describe it ) and you have so many choices you could take. Then again, maybe you could look at it another way. What do you really need in life ? I’m here in Asia, Cambodia. Its a strange story, but the bottom line and the subject of some humour and discussion amongst friends, is that “I couldn’t think of a good reason not to come.” Another way of saying, why am I really staying in the UK ? With no house, no car, and pretty much no possessions. It makes it really easy to just uproot myself and move. You’re thinking, wow, that’s fine for him. There are a whole list of possible complications for me and I’ll spare the details, like family, children, jobs, finances and so on. Not to mention, well, all that stuff we have, the stuff the children have, that I have. We all have. Yep, this is where I was. I came up with some really good excuses not to come. Some around stuff, some around emotions and some were based on fear. My own fears. But what happens if you just take a big step back at the situation and say, ‘OK, what’s the worst thing that can happen by doing this ?’. .. and that, is why I’m here. I like to talk about the more philosophical aspects of minimalism, the big picture and you’ll excuse my lack of details on occasion. In this case, I had to eat my own words, eat my own dogfood as a the developers say. Bite the bullet, and all those other cliche’d phrases. 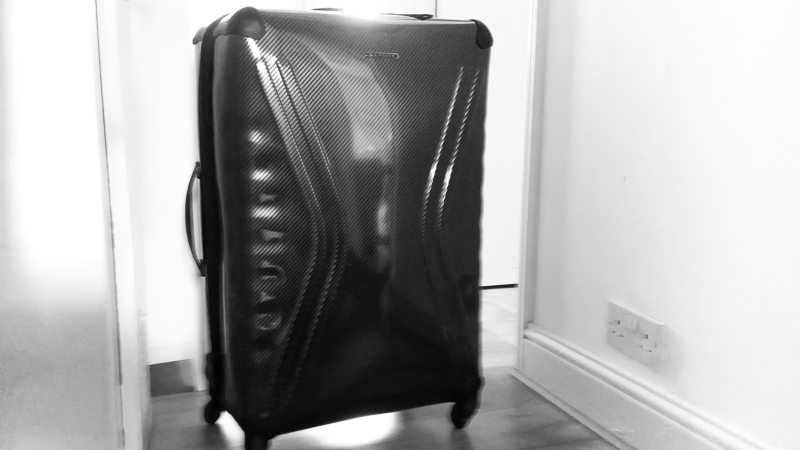 My life needed to be packed into 23kg, and some hand luggage. What does life in a suitcase looks like ? – what are the important things ? I’m a bit of an amateur at this. These backpackers have a head start on us minimalists. I read so many blogs before packing. The best idea I had was to imagine I arrived at the airport to be told “I’m sorry sir you’re at double your allowance”. Its a fascinating idea to then have to look at everything so objectively. What to I really need, what is an essential ? In hindsight, I should have photographed everything. Sorry there are no pictures here. So what were the things that found their way on board ? – My Nespresso coffee machine. Yes I know, its a luxury and many would call me mad. But the importance of my morning ritual is paramount, its a part of me. There are a vast array coffee shops here I could visit, ( quite a few with dreadful coffee) but they won’t be open at 5 or 6 am. I’m not going to justify myself, its just a part of who I am. I love good coffee. I’m not fidgeting at all as I write this ! – A small speaker. I love my music, again its a part of who I am. I’ve had to leave behind my treasured vinyl collection and my Retro Hi-Fi. So I needed something small, the smaller the better, but I wasn’t willing to compromise too much on the quality. So albeit its not the cheapest of options I’m really impressed with the sound quality of the Bose Soundlink when paired with Spotify. Yes, it probably shouldn’t, but Spotify works here. – My camera and a couple of lenses. Again this is a part of who I am. Having been a professional photographer for a couple of years, as well as a keen amateur, I love taking photographs. Good job really as I’ve been volunteered on an assignment to take photographs at a football match tomorrow. To be honest, what these things are is not important. They are probably a bit bizarre and very much individual to me. I’m almost anticipating the Trolls to appear on this post especially. But as you’ve probably gathered. This post isn’t about things, about selections and priority stuff. That’s the thing about minimalism. Get rid of things, physical, digital, mental and it creates space. Creating space gives you room to see. It gives you freedom, so the results of my minimalist survey say, and if you are truly free, you have a world of choice. So in my usual rambling style, how do I tie this all together ? Whats the message here ? Life, isn’t about stuff, its about choices. Seldom do we need what we think we need. In honesty, the few things I brought with me, I could do without. Coffee, yeah, I love the good stuff, but its hardly the end of the world is it ? The things that we hang on to consistently over the years, are part of our character. I love music, the 80’s are my favourite. Its a part of me, it why i love vinyl, its why I suddenly turn up the radio, or sing, or more likely say ” they don;t make them like this any more”. Its a part of me, it is me. Its a part of my life’s story. Sometimes, we just have to take a leap of faith. This has nothing to do with minimalism, and everything to do with life. Everything to do with our ‘why’. I would have regretted not doing this for a lifetime. Why not. As Doctor Pepper says, ‘what’s the worst that can happen?’. In my case I get back on a plane and go elsewhere. Guess what, I didn’t need to do that. All of this rambling is not really about minimalism. Its about why we choose less. Its about what this enables us to do. It’s about how minimalism opens up so many doors for our lifestyle. Its about the possibility of adventures. We shouldn’t forget that minimalism is a journey, a means to an end, but its not the ultimate goal. The real goal is why, and what it enables us to do with our lives.